Shared inboxes are the perfect way to help your team collaborate on following up with incoming calls and texts. 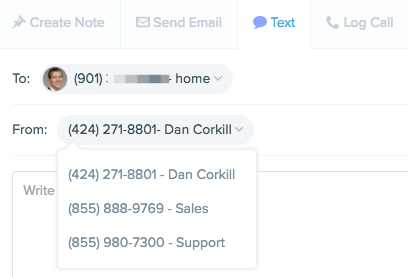 When you create a shared inbox you can select who has access, a phone number, and call routing behavior. Each shared inbox gives your team an additional company phone number that can be used for receiving calls and texts as a team. 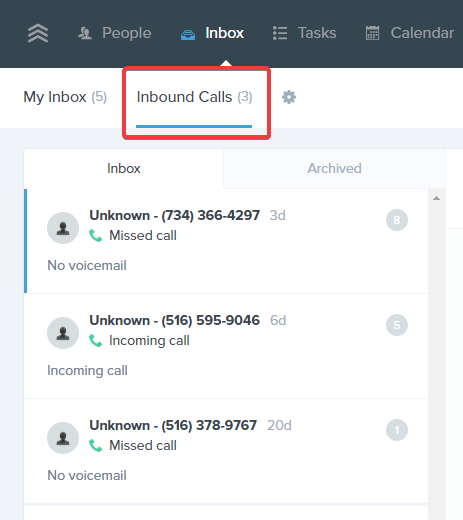 Phone calls are the most valuable leads, with the shared inbox your team will have every single missed call/voicemail tracked in one place so you don't miss out on sales. This feature can be enabled for any account with two or more calling licenses. Click the gear icon to see a summary of your Shared Inbox numbers and members, then click the edit icon at the right to adjust settings. The shared inbox settings screen is divided into two sides. On the left side, you can select who has access to the shared inbox. Admins can always view the shared inbox, users need to be granted access via this list. If you want one of your team members to receive incoming calls to the shared inbox with the calling add-on you must add them regardless of if they are an admin or a user. Users that have the calling add-on available will have a phone icon next to their name in this list. Note: The calling add-on can only be used to receive calls on the desktop from the shared inbox at the moment. As a workaround, you may specify mobile phones to be rung for incoming calls, explained in more detail below. This option will ring multiple team members during incoming call, and the first to answer will speak with the incoming caller. Members of the group who have the calling add-on will receive an incoming call in the Follow Up Boss desktop app. Additionally you can add up to 5 mobile numbers by clicking 'Add Phone Number' and either choosing a user, or typing any phone number. Note: When using this option, there is a combined limit of 10 desktop users and mobile phones that may receive calls. That means that if you add 2 mobile numbers, only 8 desktop users may receive a call. We use the ordering of the users on the left side to determine who receives a call on the desktop app if you are over your limit. Any users that have the calling add-on and are members of the group but will not receive calls will have their phone icon changed to reflect this. If you're over the limit but want a certain desktop user to receive a call you can add a '!' to the front of their name to have them earlier in the list. Go to voicemail: This option will send all incoming calls to the voicemail of the shared inbox immediately, without ringing anyone. Forward to number: This option will send all incoming calls to the mobile number specified immediately without ringing any other members. There is a chance in this scenario that a voicemail is left on the mobile device itself, rather than in the shared inbox. This option is only available when 'Ring first X shared team members...' is selected for incoming calls. Go to voicemail: Any calls that are not answered by your team members will automatically go to the shared inbox's voicemail, as normal. Forward to number: Any calls that are not answered by your team members will be forwarded to the mobile number specified. There is a chance in this scenario that a voicemail is left on the mobile device itself, rather than in the shared inbox. This option is only available when 'Ring first X shared team members...' is selected for incoming calls and only if office hours are setup. Admins may set office hours on the company settings page by pressing the 'edit' link in this section. 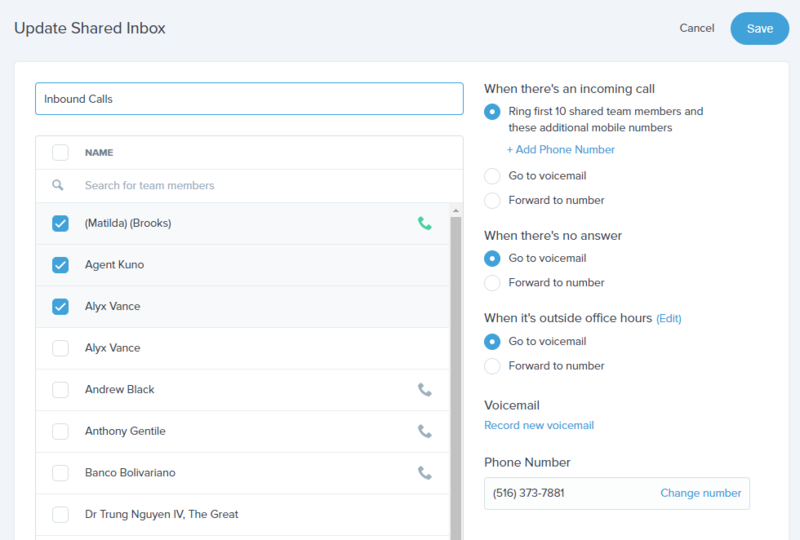 Go to voicemail: This option will send all incoming calls outside of office hours the to voicemail of the shared inbox immediately, without ringing anyone. Forward to number: This option will send all incoming calls outside of office hours to the mobile number specified. There is a chance in this scenario that a voicemail is left on the mobile device itself, rather than in the shared inbox. You can change the voicemail message played to the incoming caller if no one answers the call or 'go to voicemail' is selected. You can change the phone number associated with this shared inbox. If you have already given out this number to clients or printed it on any media then changing this number is not advised. Anyone trying to call the old number will find it out of service. Any shared inboxes you are a member of will be displayed to the right of your personal inbox. Additionally admins are able to see all shared inboxes. Missed calls and text messages sent to your shared inbox number will show up in the inbox. Anyone with access to the shared inbox may take action on these items such as for returning calls (requires the calling add-on, desktop only), or sending text messages directly from the inbox. Note: you will not get a separate alert about text messages so you need to check the app, this is because it's a shared inbox that multiple people check. After you've taken care of a voicemail, missed call, or text message you should archive the item using the button on the right so everyone knows it's complete. When texting on individual contacts you will now see an option to use your shared inbox number or company text number (individual texting number if you have the calling add-on). This is useful if you want the reply text to be checked by anyone in your team or if you are using different area codes with your numbers.